Lovely place with great staff, tidy rooms, perfect tips and an amazing roof top with a beautiful view (plus bar in the evening). Would definitely recommend and stay there again! It is a very good place. Clean facilities, a roof top terrace and georgeous paintings on the cealings. Nice and helpful staff. Showers a bit small. Very beautifull dorms. Nice balconies and all in all a nice stay. The breakfast is very sweet with cake and cookies. Staff can give you nice tipps just ask them. 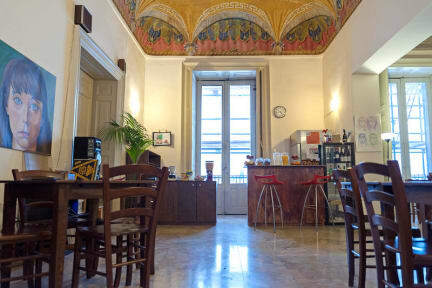 Really good located hostel in the Center of Catania. On the hostels roof you have a perfect terasse where you can see over the piazza universita. And the most important highlight is Angela! She was just amazing. Thanks for everything! The Hostel is really good. But one night, in a room of 8-10 one person was in control of the air condition and despite it was not cold inside, it was really cold inside. Dont know what you can do about it, but that was my experience and it of course influenced the quality of my stay. To be fair, really good breakfast ! Beautiful old building with impressive frescos. Very spacious room. Location right in the middle of the city center. Good breakfast included. Nice common area. The beds had curtains, but unfortunately the upper beds don’t have a roof or something, so when the lights are on the curtains don’t help. Each bed comes with a shelf and a light. The dormitory was next to the living room so it was clairaudiant, especially when one group started partying after midnight. Obviously no quiet time at night. Overall a nice hostel to stay. The location is good and also the atmosphere with some nice balconies with a nice few. The hostel has an amazing location with a great view from the roof terrace. When we arrived, we were told different check in times and had to wait 2h in total. The staff was friendly, but sometimes ignored us when we were waiting to ask a question. One night when we wanted to have a beer on the rooftop of the hostel, we were told we can only sit in one corner of the terrace, where there was no space left. The rest of the terrace was reserved for people who were not guest. A bit disappointing! The hostel was very cold. Since I have already read this in previous reviews, I have taken me to sleep extra sweatpants and a long top. But in the room it was so cold that I did not even want to change clothes and while sleeping I kept a hood because it was too cold on my head. In addition, it was very loud throughout the whole night. The door was so loud, so that you woke up everytime someone came in the room.